There are many terrible ways to measure your self-worth. I can think of several off the top of my head: how long it takes to fit back into your jeans after pregnancy, how your children react to your cooking, or how much traffic your blog gets. Tomorrow Pink Dryer Lint will celebrate its second anniversary, which means that it's finally a toddler. I've learned a great deal -- about blogging, about life, about myself -- during these years. For example, I've learned that some bloggers have more readers visit their site in a single day than the total sum of people who have visited Pink Dyer Lint over the course of its 729 day lifespan. I'm choosing not to let it be. You see, I love to write. It's who I am. I make sense of myself as I tease out these words. My prayer is that you benefit from these words as well -- that they encourage you, that they make you nod along in understanding, that they bolster your faith, and that they cause you to laugh. I want you to leave this blog feeling better than when you came. When this is my focus, I know that my time spent blogging is in alignment with God's will. Sometimes I lose sight of my focus, though. Have I mentioned that I'm writing a book? (I'm writing a book.) 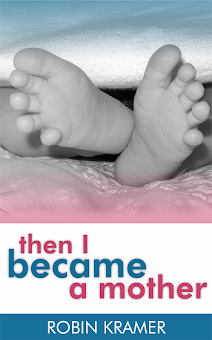 It's called Then I Became a Mother, and it will be published this fall. Brace yourselves; it's going to be excellent -- and because I know it will be excellent I want people to read it. As in, more than seven people. To reach this goal I've been working to build a platform, which is code for a) expanding my blogging reach, b) employing effective marketing strategies, and c) testing the patience of my husband with how many times a day I use the word "platform." Bigger. BIGGER. BIGGER! I want Capital Beltway traffic to my blog. I want mega-bloggers to invite me to sit with them at their lunch table. I list contacts and plot endorsements. There's nothing wrong with growing a blog or promoting a book. But when that becomes my only focus, my head spins and my heart sighs. Because I realize something in my core: I won't be any more content if my blog explodes with readers and my book becomes a bestseller. If I'm not content with what I have now, I won't be content if what I have doubles or triples. If I'm perpetually on a quest to grasp what's next, I forget how much I've already been given. If I'm searching out highway traffic, I overlook the simple truth that I'm a person who sometimes prefers back roads. I once heard a great quote: "I'd rather be faithful than successful." It's inspiring, isn't it? It sounds so holy. If I had to choose between the two, I'd side with faithfulness as well. But the truth is, I'd like to be both faithful and successful. The two concepts aren't mutually exclusive. This is why measuring success by numbers -- or dress sizes, or salaries, or book sales, or how people react to us, or whatever other arbitrary mechanisms we set up to gauge our worth -- is so futile. We're more than these things. So much more. 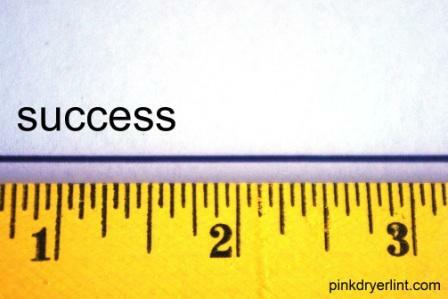 Success can't be quantified and reduced to a mere number. We can't view our significance through such narrow metrics. If it took me two years of blogging to fully grasp this, it's been entirely worth it. Thank you so much for letting me share life with you along the way. It's humbling, and I'm grateful. Robin, this is such great advice. I, too, get caught up in blog numbers sometimes (and my 14 whole followers), but I have to remind myself that I write my blog for me and for my girls. Followers are just a pleasant bonus. I for one love your blog and always leave it "feeling better than when I came" and I cannot wait to read your book!!! Thanks for the constant reminder. Keep pushing the boundaries...and I'll see you soon hopefully. This is my goal in blogging, too: to write (AND print/bind) for my children. The minute I start to lose focus, I start to feel miserable. What a lovely post! It's so hard not to get caught up in the numbers, but a great lesson to learn that our worth is not determined by a number. Congrats on the book deal!! I can't wait to hear more about it! You've always been so encouraging, Mikhail. Thanks! Yes! That job offer is coming, Brittany! Aw, thank you, Lisa! You're so kind and encouraging, and I'm glad that you understand! I love that you're going to print and bind your writing for your kids, Brandee! Yes, God truly been teaching this to me, and it's starting to truly take root in my heart. Thank you for reading and thanks for your comment, Gina! I seriously cannot wait for your book. And while I'm absolutely certain you're going to gain much fame in blogging as time goes on (I really, really am), I am a little bit glad you're not famous now. Because if you had thousands of people following you, you probably wouldn't have had the time to talk to me in these comments and we wouldn't be good internet friends. I'm so glad that we've become friends, too, Ami, and in some small way, to share our lives across these miles! I wanted to click the "like" button after reading your post. Well put! What a great post! I'm glad I found this blog. You're right. You've got to be happy with what you have right now or you'll always find a reason to not be happy. I often get discouraged about my blog numbers. Then I start to lose focus. I like your take on it. Steph, thanks so much for your kind comment. It's so easy to lose focus, so writing this post was a much for me as for anyone else! I'm glad that you liked it! robin...every time i visit your blog it's really like i'm reading my own thoughts. i, too, have been searching for ways to expand my blog and to gain readership, although at the same time have reminded myself that this is not my main goal...i am a writer, and my goal is to get it all out in writing, daily, on my blog...with the intent of making their days happier, making them take a moment to smile. and...i hope to soon be starting my book, as well! congratulations on yours! i can't wait to read it! Sara, thank you so much for your comment! I'm touched that you liked the post. Do keep me posted on the progress of your book!